Ken Lisbourne, "Cape Thompson!" 2004. Image Courtesy of Anchorage Museum. In Anchorage, Alaska, a starry museum exhibition with decolonial aims baits an easy celebration; it’s tempting, if somewhat patronizing, to view the existence of such a show as a victory in its own right for the typically inward-facing, isolated locale. The Anchorage exhibition is part of an ambitious multi-city survey, Unsettled, which seeks to illustrate the uneasy relation between where we live – what we perceive as “settled” – and the unstable reality of shifting, unresolved landscapes, and the peoples who live there. Organized by the Nevada Museum of Art (NMA)’s JoAnne Northrup, with consulting curator (and contemporary mega-artist) Ed Ruscha, Unsettled places works by Indigenous artists alongside those of white settler and immigrant artists. It punctuates contemporary artworks with historical artifacts, modernist representations, and myth-busting frontier visions. Still, the three major museums that produced Unsettled (Nevada Museum of Art, Anchorage Museum, Palm Springs Art Museum) fail to fully acknowledge the histories – the previously set-stage – of their own colonial past. And so, the exhibition is never quite realized as the site of decolonization it might have been. Unsettled characterizes itself as a representation of the “super-region” known as the “Greater West,” geographic area described by the exhibition as encompassing “the entire west coast of the Americas.” It conceptualizes this territory as “the last part of the planet to be explored and settled by Homo sapiens, and describes a region composed of “vast expanses of open land, rich natural resources, diverse Indigenous peoples, [and] colonialism.” But the image presented by these artworks is not that of powerless, colonial victimization. Ana Teresa Fernández, “Erasing the Border (Borrando la Frontera),” 2013. Image Courtesy the Bedford Cherubino Collection. Rather, the work in Unsettled demonstrates a persistent resiliency and desire to resist the many forms of imperialism. A short video by Ana Teresa Fernández, for instance, documents her work Erasing the Border (Borrando la Frontera) (2012) for which she painted over the imposing, steel black fence between Tijuana and San Diego. Coated with Martha Stewart-brand blue paint, the border veritably (and almost pathetically) disappeared against the ocean-sky vista. Physically speaking, the artwork is harmless – the wall is, of course, materially impenetrable. But psychologically, ideologically, and spiritually it is a gentle act of defiance. Where the work of Fernández represents some of the human conflicts in the Greater West, other pieces speak to the region’s environmental tug-of-war. 1964 Earthquake Robe (2006) made by Teri Rofkar (Chaas’ Koowu Tlaa, of the Raven Clan, from the Snail House) records the artist’s experience of the 9.2 Richter-scale tectonic event known in Alaska as the Good Friday Earthquake. Using the ancient Ravenstail weaving style, the robe is a document of one of the most significant land events of the Greater West’s settled history. The 1964 Earthquake caused bridges to collapse, railroads to buckle, streets to drop, buildings to burn, and landslides to pull entire coastal homes into the ocean. These are only two examples, but it’s fair to say that all one hundred and ninety-eight of the other individual works in Unsettled are aligned, in some way, with the project of decolonization. Even the colonially-motivated, early-twentieth-century Modernist pieces seem to point out struggle more than they reinforce their historically embedded prejudices (Emily Carr and Gerard Curtis Delano’s portraits of Indigenous peoples and places, for instance, or Georgia O’Keeffe and Agnes Pelton’s sublime landscapes). In their presentation in Anchorage, these works stood in face-to-face dialogue with the peoples from whom they appropriated; Carr’s Totem Forest, and Vanquished hung four feet from Brian Jungen’s overwhelming 1960, 1970, 1980, and 2007 totems. While every piece in the show points smartly towards decolonization, however, the result fails to equal the sum of its potential. Perhaps inevitably, Unsettled introduces the region as a fertile habitat for art market exploitation – re-colonizing the zone all over again. As a result, the show quells the affective impact of artwork that speaks to the resilience of the marginal, by categorizing, appraising, and parading it through the various exercises of exhibition-making and promoting. After all, any survey exhibition is mainly a “who’s who,” and “may-I-present-for-you”: a drawing-into-the-folds of the artworld’s bosom of approval. Unsettled is organized by three museums with a vested interest in promoting the saleable notion of “the West.” As such, the exhibition cannot escape its central function: bolstering the Greater West region and endorsing its artists and institutions as competitors in a market otherwise firmly centered in Los Angeles and New York City. With its intense regionalism, Unsettled draws yet more borders of assimilation, even as it attempts to argue against fences. Like most large-scale surveys, it suffers from the homogenization and under-representation of its region’s various minorities. Where, for instance, are stories of the region’s Black people? Chinese and Indo settlers? And as if to reinforce the exhibition’s irrepressible colonialism, at the end of her title catalogue essay, Northrup rearticulates the head-over-heels colonial drive: “Now, with no land left to conquer, we must seek new frontiers to satisfy the human need for exploration – in outer space.” Here, she gives away the institution’s colonial future, as well as its past. After all, a museum would cease to exist if there were suddenly nothing more to “conquer,” collect, and domesticate. Sonia Falcone, “Campo de Color (Color Field),” 2012. Image courtesy of the artist. It’s lamentable to have to criticize an artist like Ruscha at this moment: a left-leaning, artworld star linked to both Pop Art and the Beat Generation, whose work is a critical, biting, humorous take on the pains and paradoxes of American culture. Much like the other works in Unsettled, the individual Ruscha pieces also entreat us to evaluate popular reflections and mythologies of the Greater West. Nevertheless, Unsettled’s curators chose to center the exhibition, not around ideas of status quo deconstruction, but around Ruscha himself. In the original version at NMA, Ruscha’s inclusion in all five of the show’s thematic areas meant that the show undeniably revolved around his work – that of the white, male, settler, colonial ego. With this in mind, it’s almost impossible not to experience every area by consulting the room’s Ed Ruscha piece for comparison, narrative, and meaning. The worshipful sense lingers in the Anchorage installation of Unsettled (even though three Ruschas were edited from that edition). That Ruscha was one of the curators makes this emphasis even more troubling. Was every curatorial decision made in deference to the artist’s own oeuvre-gazing introspection? Visually, Unsettled trades on a clichéd image of the “West.” The show relies heavily on a cowboys-and-Indians, dusty orange desert aesthetic. 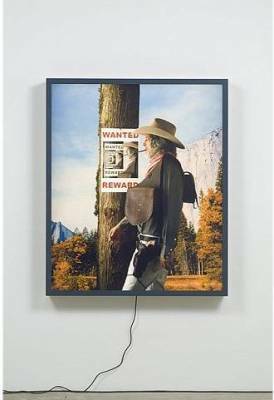 Rodney Graham’s Paradoxical Western Scene (2006), Francis Alÿs’s Tornado, Milpa Alta (2000-2010), Andrea Zittel’s Prototype for Billboard at A-Z West: Big Rock on Hill Behind House (2011), Paul Kos’s Roping Boar’s Tusk (1971), Edward Weston’s Rhyolite, Nevada (1938), Mark Klett’s Bullet Riddled Saguaro, Near Fountain Hills, AZ (1982), and even Sonia Falcone’s potent, powdery, terracotta spice bowls of Campo de Color (Color Field) (2012) all operate in this palette. While each of these works independently wields critical perspective, placed together in Unsettled, the sweeping visual effect is a repetitive mythology that almost entirely ignores the boreal forests, mountain ranges, fertile plains, glaciers, tundras, snows, and urban centers which also fill the Greater West. Perhaps this is unsurprising in an exhibition that chooses to characterize the region as a “geography of frontiers”: a monotonous, assimilated landscape reminiscent more of genre film than lived reality. Against their inescapable urge to mount blockbuster survey exhibitions, how can we be anything but sceptical of a major museum’s attempts to suppress colonial roots and capital motivations – to present a meaningful gesture against settler colonialism? Unsettled sells us local stories of earnest resistance in pre-packaged and re-colonized form. The show stands as an example of how corporate branding and institutional prerogatives are a very short road back to the museum’s inescapable and brutal history as a tool of colonization.